One of the major topics in the Harris household is talking about our schedule and priorities. There are always several things to choose from with regard to how we spend our time. We can invest in ourselves; school, exercise, spiritual training, music/arts, or enjoying various media forms such as reading, movies, television, and surfing the internet. We have those things that cause us to interact with others and each other such as socializing, meeting the needs of others, and family time. Then there are the commitments that need to happen to support our daily living; generating an income, maintaining the home, paying bills, and ensuring the budget is in order. 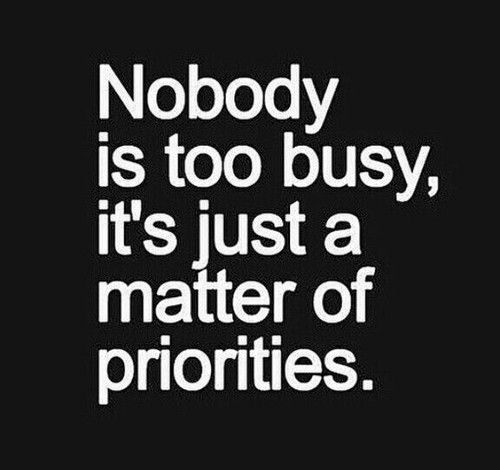 If we don’t know our priorities, then everything is priority, which results in nothing being the priority. Upon reading this verse, the phrase “satisfaction of a job well done” spoke to me first. Like my peer Jennifer Armstrong, I’m a list person. Nothing like a good list then knocking it down. Satisfaction! Then the next part of the verse spoke a little louder: you won’t need to compare yourself to anyone else. Turning the sentence around, I take it to mean that if we don’t pay attention to our own work, we won’t have job satisfaction, and in doing this, we will measure ourselves by what others are doing. We’re not talking about the “good” focus on others here; I believe this is referring to things that turn to jealousy and unhealthy competition. God made each of us for a unique purpose; the more we seek and act on this purpose, the closer we can come to reaching our potential. The key here is what voice we are listening to: that of our own desires or that of the spirit because no matter the apparent result, we reap what we sow. What we put in is what we get out. Seeking after our own earthly desires yields corruption, seeking the will of the Spirit reaps eternal life. It is okay to say no. God gave us freewill. We’re responsible for our choices. Knowing my priorities helps me to say no. Sharing my priorities with friends and family helps them understand why I am saying no. In closing, here’s a great reminder as to what God sees as priority, and I say amen to that.